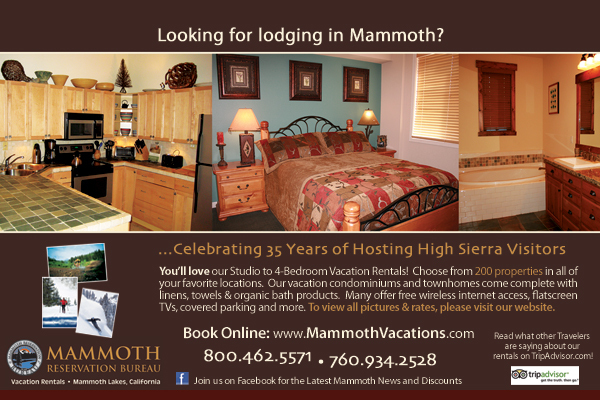 Mammoth Lakes and the surrounding areas are blessed with an abundance of awesome lakes and babbling streams. During the summer months, these waters feature both recreational paddlers out for a scenic afternoon and fishermen trying to hook a trophy-size trout and canoing and kayaking opportunities are plentiful. Spend the day in a fishing boat on one of the many lakes of the Mammoth Lakes basin. Rent a canoe or kayak, venture out and enjoy the spectacular fall scenery. There is great fishing to be found throughout the Eastern Sierra, but if you are looking for the big ones, then you need to get out into the water. Mono Lake has the most amazing all natural sculptures called the tufa. These formations take on a whole new perspective when you paddle by them in a boat. Learn about Mono Lake's history on a guided kayak tour. The migratory birds make for an unforgettable boating adventure. Most all the major lakes in the Eastern Sierra offer boat rentals and quite often there is an affordable half-day rate that will put you on the water for almost nothing. Boat rentals are available at the following lakes, and check out what's available in the Outfitters section. June Lake is also a haven for people who like to float in a boat! The real "June Lake" also has a swim beach in addition to allowing power boats. Gull Lake and Silver Lake are small, but filled with trout and are often thought of as secret hideaways. Being smaller, people assume they have small fish, but not so. Grant Lake is the biggest. You can water ski on Grant Lake as well as fish. If you're itching to get on a jet-ski, this is the place to do it. You'll have to get your Jet Ski rentals and bring them in as the marina currently doesn't offer them, even though they are allowed. How can you possibly know which lure, bait, hook, rod to use for the Mammoth fish? Let an expert show you how. You will find some helpful people in our guides section who can take you on fishing adventures you would have never dreamed. Yes, the bait and tack stores will tell you where the fish are running, but a guide can plan an adventure you would never have on your own. Consider hiring a guide to take you places... you can't even drive to. Our fishing sections also have many of the common places to drop your pole. If you're thinking that you would like to dock your boat, walk off the water, and into a cabin, then you're thinking of our neighbor, Convict Lake. The resort offers the convenience a fisherman enjoys with a lake, boat docks, launch, bait and tackle shop, and if your so inclined you could even get one of 28 Convict Lake cabin rentals. They also have the most fishing derbies of anyone in Mammoth... and The Restaurant at Convict Lake is one of the best in the Eastern Sierra.